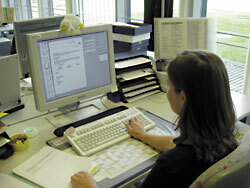 70,000 pages a day are scanned by the different lines of the HUK-Coburg Group of Insurances. Most of them are forwarded on the same day to the electronic Document Management and Archive System. The key role on the incoming side is played by the DpuScan Software from Janich & Klass. Attractive products and highly competitive tariffs make the HUK-Group a growth-oriented insurance company with relatively safe jobs. Organizational and system-technical optimization measures never yielded to reduce the number of jobs. Not even in 1997 when the paper flow was completely replaced by an electronic system, in the health insurance, and still not now that more insurance fields use widely paperless document processing. "The increased use of image processing always compensated the increased work in the branches ", says Udo Vetter, Manager of the image procession group. In parallel, they always aimed at an improved service quality that rates highly at HUK due to their nearly complete abstention from cost-intensive field service. Meanwhile, HUK holds a top position in all fields among the German insurance business, with their client-oriented willingness for information and a high degree of information on the management assistant level. One of the essential roots is the host-based workflow system for document management and archiving. It consists of a chain of components, starting from a scan solution that also serves for assigning order keywords. From there, the data are forwarded to the mainframe which automatically distributes the work to the management assistants, by means of these order keys and document classes. It also handles the final disposal in the archive. By far the largest portion of the incoming mail is therefore electronically available on the desk of the assistant on the same day. This extremely fast and safe conversion of mixed paper to an ordered electronic form is no magic in this case, but the result of using eight Scamax mid-volume scanners that use the batch scan software DpuScan from Janich & Klass. The software solution has been adapted to the individual demands of HUK; it is in use in the health insurance (about 40,000 sheets per day), in the life insurance (about 6,000 sheets per day), in the building society line (about 8,000 sheets per day) and in the car damage line (about 3,000 sheets per day) - here actually in three branch offices as a pilot project and in short exhaustively. The biggest portion of incoming mail is scanned in the central mail department in Coburg. 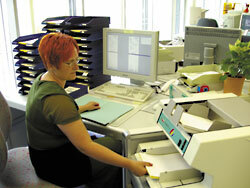 Only documents that reach the branch offices after 11 AM are scanned locally on smaller systems. Mixed originals must be processed, in many different formats and thicknesses, including color and black/white graphic material. At HUK, the scan process features a specialty: "Our solution is technically more demanding", says Udo Vetter, " in contrast to most of the other insurance companies, we scan before the management assistant receives the mail. This has essential advantages for its availability in the archive. We can not allow that the archive is not always available, for the work would then be blocked for the management assistant." Already while scanning from the batch, the software generates an initial indexing from the attached cover sheets, using the insurance ID number and allowing an arrangement to the individual divisions. Simultaneously, a first-page-filter assures that superfluous pages are deleted and that only cleaned information is generated for the workflow. This reduces considerably the amount of data to be transferred via the network. The comfortable indexing module of the scan software simplifies the subsequent indexing. This work is done in the so-called OpenJob mode without a process break any more between the scan process and the indexing process. The indexers who work at their stations - also in the branch offices - use the same software and are able to make eventually required corrections or quality enhancements without the need for a classical re-scan. By the way, indexing is done in context-specific dialogs as every division requires other information from the documents. The decision-making argument for DpuScan was the readiness of Janich & Klass to adapt their software to the HUK-specific indexing demands. Stefan Geuther, responsible for automatisation of the scan process in the Informatics department: "What made up our decision for using the Janich & Klass Software was its open structure and the possibility to add available information defined by ourselves, for every scan task. We were not ready to adapt our structures to the software, but we expected that our demands were integrated into the program. The cooperation with Janich & Klass - whose preceding DpuScan version had already been installed here - was very co-operative and satisfactory." The decision-makers at HUK appreciated the fact that Janich & Klass, as the German manufacturer, was able and willing to accept all their individual demands. So, the scan software specialists from Janich & Klass created, from HUK's requirements, not only desired indexing masks, but also a Plug-In interface for their integration. This interface meanwhile became a standard in the software and can thus be utilized also for other applications. HUK-specific however was the modified batch procession, where indexing information is gained from the cover sheets, for automatic generation of indexing masks for the individual divisions. By introducing the system in all their divisions, HUK has come pretty close to the ideal of a paperless workflow- and archiving organization. There are nearly no physical files any more. The scanned originals are kept for three months, in batches, as they have been scanned - for the rare case that an original must be returned or that the managing assistant might not be able to read its image clearly enough. The image files are electronically kept until the contract expires; depending on which division, between half a year and a full year on the hard disk of the main frame, later on tape. But most of all: The service quality now is on top level, in all divisions of HUK. The management assistant who handles the file has fast access to all relevant processes and gets up-to-date information about incoming mail. In due case, also any other colleague can access the files and can thus report to the customer. Furthermore, the operation is simple, and the management assistant is automatically informed when new material comes in for him. Only one key must be pressed to initiate complex processes. So, there were no acceptance hurdles worth mentioning. Concerning the functionality of the scan software, HUK feels prepared also for the near future. Ronald Günther, responsible for the fields of scanning and indexing, and also for the maintenance of DpuScan: "Until now, we have not fully used the OpenJob, yet. There still are many integrated functions that we can implement. Like, for example, the possibility to "virtually" rescan a page of a document with a non-satisfactory quality, directly during the indexing job, without the need to delete the complete document and to restart scanning anew." An enforced OCR processing in order to automatically read the order term, or client-specific invoicing forms with barcodes in the health insurance are subjects that occupy the HUK responsibles. The foundation stone is already laid - with DpuScan. The HUK-COBURG Insurance Group - founded in 1933 in Erfurt as "Haftpflicht-Unterstützungs-Kasse kraftfahrender Beamter Deutschlands e.V." - is among the largest German insurers in the private range. It comprises six insurance companies and a savings bank. As mutual insurance association, the mother company HUK- COBURG insures exclusively public sector employees. The daughters HUK-COBURG General, Legal Protection, Life Insurance, Health Insurance and the savings bank, as also the mere online insurance company HUK 24 are open for all people. The 6.858 employees in the Coburg headquarters, in 39 branch offices and in 400 client service offices produced a turnover of 3.85 billion Euro in the latest business year. DpuScan 4.1 from Janich & Klass is a production scan software for color and black&white. It allows the capture of data via user-oriented dialogs and a secure quality control with integrated image enhancement possibilities. Images are stored as sorted by recognized document information. A comfortable indexing module is implemented as a plug-in interface. It allows, in the OpenJob, indexing after scanning and offers different possibilities for image enhancement. Thus, classical re-scans are no longer necessary. Even more: DpuScan 4.1 enables a duplex scanning sheet to be split up into a maximum of 20 zones with different topics.